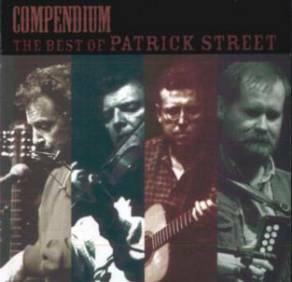 Distilling the essence of Patrick Street into one album would deter most compilers, but that’s the task the band’s Ged Foley faced with Compendium: The Best of Patrick Street (Green Linnet GLCD 1207). Patrick Street have always combined a subtle blend of musical diversity and tradition, while its members’ histories saw the band acquire ‘supergroup’ status on the release of their self-titled debut album in 1986. This rich pedigree lies in the Sligo-inspired fiddle of Kevin Burke (renowned for his work with The Bothy Band and Micheál Ó Domhnaill), the Sliabh Luachra polkas and slides of Jackie Daly (De Dannan and Buttons and Bows) and the voice of Andy Irvine, pioneer of the bouzouki with Planxty. Original member Arty McGlynn has been at the forefront of Irish guitar players for thirty years, while the current incumbent, Ged Foley (ex-House Band) is also a notable exponent of his native Northumbrian smallpipes. Compendium captures Patrick Street’s prowess on a stunning set of reels catalysed by virtuoso fiddle on Jenny Picking Cockles, and Daly’s vibrant accordion on The Newmarket Polkas, one of two previously unissued tracks. Irvine’s songs, whether traditional or self-penned, are well represented here by his paean to horseracing, Stewball and the Monaghan Grey Mare, with its Balkan-inspired backing, though a mawkish arrangement of Willie Taylor dissipates the vitality of this avenger’s ballad. Patrick Street’s ‘signature tune’ and most noteworthy addition to the Irish canon, The Penguin Cafe Orchestra’s Music for a New Found Harmonium, is here too, albeit in a somewhat lacklustre live version.. Nevertheless, this is still a comprehensive introduction to the band’s back catalogue and Ged has almost managed to distil the pure drop! This review by Geoff Wallis was originally written for Songlines magazine – www.songlines.co.uk. For more information about Green Linnet’s releases visit www.greenlinnet.com.